Looks fine to me for getting in and out. Dunno how much gear FSB border guards would lug around with them but I'd imagine that they would pack light compared to infantry let's say; and for sure they would have a lot less heavy armament. flamming_python wrote: Looks fine to me for getting in and out. Dunno how much gear FSB border guards would lug around with them but I'd imagine that they would pack light compared to infantry let's say; and for sure they would have a lot less heavy armament. It follows outdated design of WW2 with drivers/crew hatch that would be much better if it was just a door. I'm pretty sure Tyrion Lanister designed it. Just look at this render with more conventional layout of Vystrel. Not to mention troop dismounting/mounting through back doors could be made easier with a ramp like on early Vystrel prototype . But as You mentioned border guards won't be fully equipped with Ratnik kits and don't need top of the line vehicles. Even BTR-70/80 would be over kill. Regular wrote: It follows outdated design of WW2 with drivers/crew hatch that would be much better if it was just a door. It looks to me like its designed for the passengers dismounting exactly through the back doors. Perhaps some improvements can be made but there don't seem to be any critical problems as such; pretty typical design all in all. Right, in fact they need a vehicle that fits their requirements; long-range, armour rated against HMG/Sniper Rifle fire, mine-protection, good manuverability, low weight and a grenade launcher/machine gun combo up top. The BPM-97 fulfills most of these requirements better than the BTR-70/80s. Amphibious capability, NBC protection, etc... can all be done without. grenade launchers, from the start i always thought they were very awkwardly positioned. as well as the thousands of t-72s they exported, would be easy money. GarryB and co here that BMPT needs more HE, 120 mm rifled gun should replace atgms. way to jam the ammo in the crevices made by 120 mm rounds with the turret ring(the crew originally sat there so there should be space). be in the turret on either side of the main gun. controlled from outside via datalinks, or by the acting driver and commander in a defensive mode, ie firing from hull down. EDIT: 30mm seems to be too big, changed my mind-23 mm would do. Why larger guns or mortars? BMPT doesn't need larger guns and its twin 30mm guns are excellent compromise. We have to know, what main purpose is and why it was designed. BMPT was made to replace AA guns in ground combat, which are very effective, but expensive and weakly armored. You have to know, that modern AA complexes like Tunguska or Pantsir are very expensive with their radars and computers and are not produced in large numbers. To do their AD job, they will be around 1 to 2 km behind tanks (VSHORAD) or 5 to 10 km for systems like Tors or Pantsirs. Here is the point of BMPT. BMPT will not replace BMPs or infantry, so they don't need mortars or guns, because BMPs will still be there with them to support infantry as well as there will still be tanks with their main guns. BMPTs are there to protect tanks against infantry with AT weapons and those guns are very effective against infantry and to protect tanks against their worst enemy - helicopters. Helicopters fly very low and could hide behind trees. Systems like Tunguska or Pantsir behind could not fire on them if they don't want to kill their own soldiers in front of them. BMPT on the other hand is in the same line with tanks and could freely fire on them with Ataka missiles as well as with guns. 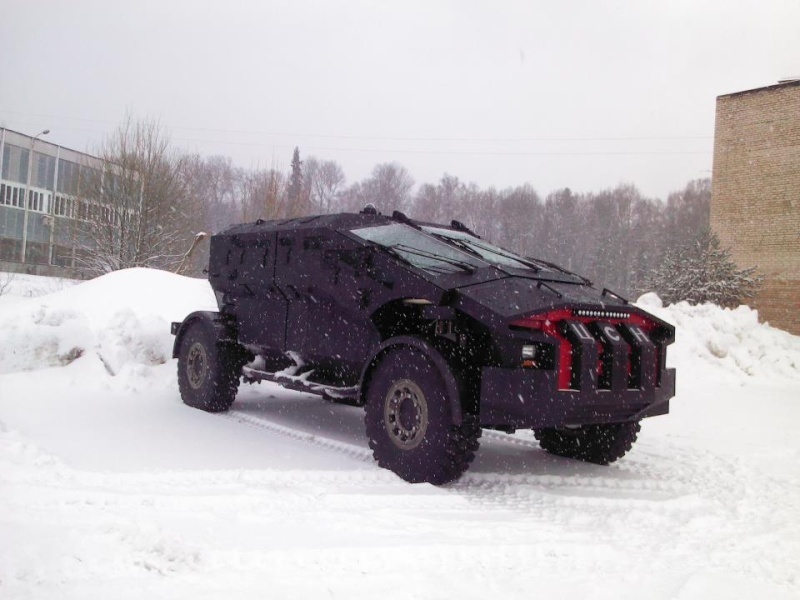 High elevation of guns and strong armor made it ideal for urban and mountain environment, specially for convoy escorts. I suppose you're right that it is very good for its intended role, however, I really think the armament is very knee jerk response to grozny and while it would perform in those types of situations adequately, in most other situations, uparmored bmps would perform equally well. So in a sense, the current armament makes BMPT very specialist vehicle, which wouldnt be bad if it wasnt intended to be produced in numbers, where added versatility is a must to warrant the cost of another hundreds if not thousands of these vehicles. Well, with next-gen IFVs they would be unneccesary anyway, with the current armament at least. Also, I think threats from infantry RPG teams popping from basements and rooftops would be reduced by APS and higher elevation weapons of IFVs and even MBTs, instead it would be 2-3 man teams firing a fire and forget Kornet or two from behind defilades about 4km away, and this is where I think a 120 HE shell would do better than a burst of 30 mm shells. Also, it wouldnt be too hard to armor a helo against 30 mm, and helos could always reduce penetration performance of 30 mm by engaging only at standoff ranges, where incidentally, ATGMs would be slower and could be even ducked, or engaged by APS, not that they cant be engaged earlier where they are slighly faster. I think next gen-MBTs and IFVs with unmanned turrets that are likely to be quite tall would allow the same elevation angles achieved by twin 30 mms today. Also, I think BMPT-72 is better protected than the orginal BMPT with the removal of the two crew positions for bow mounted grenade launchers. If they are going to have more weapons position, I really think they should look at datalinks to avoid wasting valuable interior volume. Second half of this vid- they talk about VBL. The Shilka and Tunguska were not used as ground support vehicles because of their air to air capacity... it was largely their ammo capacity and ability to deliver large amounts of relatively small HE rounds rapidly in any direction that was useful. In many ways a single 6 barrel 23mm cannon can perform this mission where its rate of fire and effective HE round makes up for lack of velocity compared with 30mm ammo. Lower velocity rounds like 40mm grenades also compliment such fire power as the more curved trajectory means targets in dead ground (ie behind frontal cover but without overhead cover) can be vulnerable to low velocity ammo when high velocity straight shooting ammo just splatters on the frontal protection... imagine a village in Afghanistan where rock walls half a metre thick around every property will mean shooting at a target on the other side of the village either means shooting through 20-30 stone walls... obviously a waste of ammo, or with low velocity grenades shooting over the walls and engaging targets that would otherwise be safe from direct fire. BMPT will not replace BMPs or infantry, so they don't need mortars or guns, because BMPs will still be there with them to support infantry as well as there will still be tanks with their main guns. The concept of Armata makes the BMPT idea redundant as it is basically a fire power vehicle like the Tunguska or BMP-3M but with the armour and mobility of a tank... armata will already have tunguska/pantsir-S1 and IFVs with tank level armour. The BMPT could probably evolve in an armata brigade to perform a fire support role when with tanks and a semi tank role when with IFVs. There was a plan for BMP-3s... because of their fire power to be used to deliver troops and then be moved to be used as a separate mobile armoured force that could be used like a light tank unit. There is potential for the BMPT to be used as a light tank when the enemy has no tanks and a high velocity 125mm gun offers few advantages over a 120mm gun/mortar. It can still support tanks... hitting targets tanks simply can't reach and protecting tanks from infantry units... and also anti convoy duties. The Duster and Vulcan were very very effective in Vietnam for convoy protection duties with two 40mm cannon and one 20mm 6 barrel gatling guns' respectively... the 6 barrel 23mm gun is light and powerful and compact and has light but very effective ammo too. Keep in mind that the armament of an IFV is dual... it has to be able to support its own troops but it also has to be able to engage enemy IFVs and in an emergency have some capability against tanks. This makes me think that the next gen Armata IFV will have a 57/45mm main gun plus 40mm grenade launcher and multiple Kornet-EM launcher. This will leave a gap in fire power of the unit, though APCs will likely have grenade launchers and 30mm cannon, but I think there will be space for a BMPT with the 120mm rifled gun/mortar, 40mm grenade launcher, 23mm 6 barrel cannon and coaxial mgs and lots of ammo. BMPT on the other hand is in the same line with tanks and could freely fire on them with Ataka missiles as well as with guns. Why larger guns or mortars? BMPT doesn't need larger guns and its twin 30mm guns are excellent compromise. As a fast reaction to an attack your BMPT gunner might turn the turret to a patch of smoke where the Javelin gunner was when he launched his missile... whether he is still there guiding his missile manually or is running away you want to fill the air around the smoke ball with shrapnel as fast as you can... a 120mm direct fire shell or a burst of 23mm cannon shells will both do that effectively. As shown in Afghanistan even a 30mm gatling from an A-10 will splatter a building with fragments but will not bring the building down or structurally undermine it. One or more carefully delivered 120mm HE shells could demolish the corner of a building where enemy fire could be coming from... the electronics and acoustic sensors on board should give you an excellent indication of position and range to targets that would otherwise be invisible. The lions share of ammo on the BMPT should be 40mm and 23mm ammo... with thousands of rounds of each if possible, but carrying 30-40 120mm shells and mortar bombs and of course 10-12 laser guided missiles would also be very useful and might make taking a MBT into combat unnecessary as the enemy might have little to no armour so a direct fire support vehicle would be more useful than a MBT. No need for it. Main force are tanks, BMPT just support them. For such target 125 mm HE-FRAG round from tank gun is enough, if not, than there are 152mm SPGs and TOS behind to deal with them. Army already have SP 120mm mortars like Nona or Vena, so no need to place them in BMPT. Also those guided mortar rounds are for ground targets, not to engage helicopters, which are main BMPT targets. ATAKA is better for this job. It is wireless and fast, doesn't have proximity fuze, which could detonate missile flying low over ground and being laser guided missile it is safe against countermeasures from helicopter like flares and DIRCM. The limited effective range of 30mm guns along with the relatively low rate of fire of the 2A42... it would be rather better to use guided rounds to engage helos.... I would expect Kitolov-2M would be more effective at anti helo engagement than Ataka and over greater ranges too. Effective range of 23 mm gun is 2 km, for 30 mm gun is 4 km. 2 2A42 guns give together more than 1000 rounds/min, what is more than enough for its job. With higher rate it is only too quickly out of ammo. Kitolov and other artillery guided rounds need laser markers to mark targets. Helicopters could too quickly change their position for those rounds to follow. ATAKA, Kornet and Krizanthema are better suited for this job. As I know US marines also use their LAV-AD in Iraq in similar way. For engaging ground targets and helicopters rate of fire with 1000 r/min is enough, what is higher is more waste of ammo. To engage faster planes and incoming bomb and missiles there are still Tunguskas and Pantsirs behind with higher rate of fire and proper FCS to do that job. True, but those heavy Tunguska and Pantsir will be still on their positions behind to do AD job and those IFVs will still carry infantry, so in this position BMPT could be better protected or have more ammo inside. I think that with the Armata brigade especially; the distinction between IFVs and APCs is going to blur to the point that they would only need IFVs really; i.e. a vehicle capable of transporting infantry, that comes with heavy firepower and is capable of directly supporting them after they dismount, as well as travel in columns or in urban areas together with tanks or in an open space not far behind them; and help them engage any threats that appear. There seems to be little point in creating an APC on the basis of something as heavy as an Armata chassis; i.e. a battlefield taxi that deposits the troops and then drops back, with only a little weaponry for defensive purposes. You might as well jack up its armament to IFV standards and use it as an IFV; it's got the armour and tracked mobility for such a role already, and its frame is able to support anything up to a 152mm tank gun. The 30mm will have some penetration capability for more armoured or better defended targets; while the 23mm can be used against soft targets. The missiles can be moved to the centre to make a sort of 4-pack; this might allow them to mounted to a sort of automatic mechanism too that retracts the frame and reloads it when the missiles are depleted. If you add in the grenade launcher and machine gun you'll have 5 different types of ammo in the vehicle. But it should be doable; the Armata chassis is big and if you take away the 125mm cannon and its huge auto-loader mechanism and all of its large rounds; you should have plenty of space for a variety of munitions and other weapon systems. But I do like GazBs 120mm gun/mortar idea too; very tempting indeed for a BMPT that can fulfill different roles depending on whether its embedded more with tanks or more with IFVs/infantry/support vehicles. flamming_python wrote: I think that with the Armata brigade especially; the distinction between IFVs and APCs is going to blur to the point that they would only need IFVs really; i.e. a vehicle capable of transporting infantry, that comes with heavy firepower and is capable of directly supporting them after they dismount, as well as travel in columns or in urban areas together with tanks or in an open space not far behind them; and help them engage any threats that appear. I agree, they may completely remove the APC for armata esp. if they could ease the restriction on turret bustle ammo/external ammo storage. 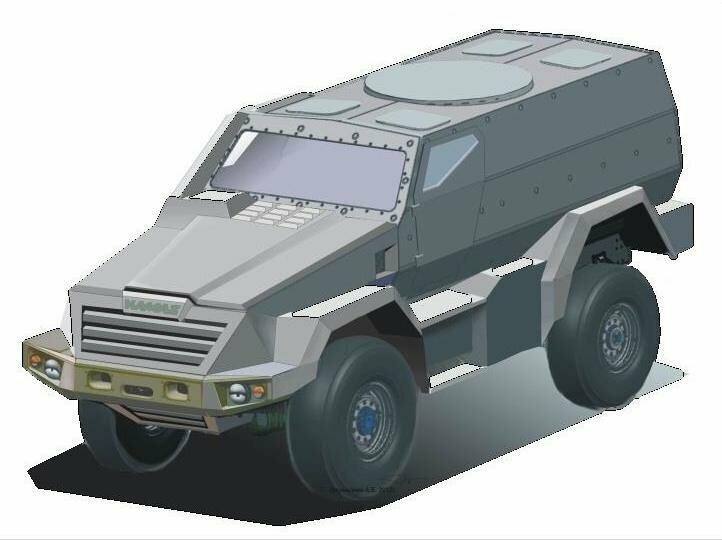 They could have a "lite IFV", the twin 30 mm cannon mounted externally, the ammo will be a vertical drum spanning the diameter of a BMPT turret(lots of overhang though). With no people in the turret, that would be a lot of rounds(the BMPT had the ammo in the same layout, except that a huge space at the middle is occupied by people- so its down to 850 or so 30 mm rounds, remove the people and I can see doubling of that). Missiles could also be placed in a BMPT layout. You are missing my suggestion. In a standard unit you have tanks and IFVs of completely different weight classes where a BMPT makes sense as it can act as infantry support for the tanks in places where exposed infantry or light IFVs wont last long... ie downtown Grozny. In an Armata unit however every vehicle has extra protection... now against a third world country you could probably get away with not having a tank and just use a BMPT to deal with enemy ground forces that don't include tanks... remember you need tanks and tank level fire power to deal with tanks... IFVs should be able to deal with enemy IFVs, so a BMPT whether it has a 120mm gun/mortar (gm) or 4 Ataka missiles should be able to deal with everything else. Against a first world country however there are prospects they might have or will eventually equip their forces to the tank level which means tanks will become critical and IFVs will likely get more missiles because 57mm or even 90mm guns wont cut it any more unless they go for very high velocity EM guns. Fitting a MBT gun to an IFV means no room left for troops which is its main role. So against a first world enemy your tanks will need to have mostly anti armour ammo, your IFVs will need lots of missiles to deal with enemy IFVs with tank level armour, which means a serious shortage of Direct Fire HE. Forget that the 120mm rifled GM is a mortar... it wont be used as a mortar as such... there will be mortar carriers in the unit as well as 152mm artillery... the 120mm gun will be used the same way the BMP-3M uses its 100mm gun... anti vehicle, anti personel. In the lighter vehicle classes it will also be a direct fire support vehicle that directly supports troops in the attack. The IFV will have HE fire power and also APFSDS fire power with a heavy cannon (45/57mm) but the size of the rounds and the number of missiles it might need to carry means a separate dedicated fire support vehicle would be useful and could even substitute for a MBT when the enemy has little or no armour. Remember a 120mm gun mortar would have rather more compact ammo than a 125mm round as the propellent charge is smaller and in fact with the different breach block it should be able to engage targets to 15km or so including with guided artillery missiles already in service including those developed for the 120mm mortars and the 122mm light artillery. Also being able to fire shells with variable propellent bag loads means much more accurate and efficient use of the weapon as well as using mortar bombs offers cheap but much more accurate direct fire HE power. With a gun you fire full power with every shot which means close targets need to be aimed at directly so the shell explodes horizontally which is very inefficient in terms of fragments... the advantage is accuracy due to short flight time. Lofting the shell with a gun is a problem because they often lack the elevation to lob shells and even if they could the high fixed propellent charge means the round will climb to very high altitude and then fall back down on the target with the problem of accuracy because of the issue of different wind speeds and directions at different altitudes. A 120mm gun mortar can use a minimum propellent load and wont go up very high at all which means much shorter flight time and still near vertical impact which is ideal for fragment patterns on the ground... especially with air burst rounds. An air burst 120mm mortar bomb or 120mm shell will be totally devastating even to a group of enemy infantry or ATGM team setting up or bugging out. Army already have SP 120mm mortars like Nona or Vena, so no need to place them in BMPT. Vena and Nona operate as artillery separate from the ground forces and deliver rounds to coordinates. BMPT is a direct fire vehicle like an ISU-152. Also those guided mortar rounds are for ground targets, not to engage helicopters, which are main BMPT targets. ATAKA is better for this job. It is wireless and fast, doesn't have proximity fuze, which could detonate missile flying low over ground and being laser guided missile it is safe against countermeasures from helicopter like flares and DIRCM. The rounds I mentioned... GRAN and Kitolov-2M are designed for ground targets... there is no reason why the beam riding missiles of the BMP-3 (Arkan) or indeed the missiles of the 100mm and 115mm tank main guns could not be adapted to the 120mm gun/mortar for use against helicopters. And having 8-10 of these missiles in the vehicle... protected by armour and all ready to fire without anyone having to leave the vehicle are all plusses not shared by the Ataka (not that ATAKA is bad or anything... it just seems a bit ad hoc). The 30mm cannon is effective to 4-5km using HE rounds... the 23mm cannon would be effective to 3-3.5km with HE rounds. The high rate of fire is useful to achieve a cluster of rounds on target rather than a stream. Very short bursts will be fired, so bursts of 5,10,20, or 50 rounds might be selectable depending on the target and I certainly agree that the 23mm gun can empty a magazine much faster than any other in service weapon but continuous fire will rarely be used due to the nature of the targets it would be engaging. The 23mm round has a very heavy payload for its weight but uses a very compact case and has low muzzle velocity and low recoil. Ideal for ground targets at short to medium range. Helicopters at 5km would have moved too far for the flight time of either round so these ranges are against ground targets too. 1,000 rpm simply isn't enough for use against a helicopter... in comparison the Tunguska has two twin barrel guns firing 2,500 rpm. It was tested on the original pantsir with 2 2A72 cannon and was found to be effective against ground targets but lacking against aerial targets so the Pantsir-S1 has two twin barrel 2A38M cannon like the Tunguska. Autotrackers could easily follow a helicopter, that is what Kornet would use to engage such a target, but I agree that a laser beam rider would be better suited, so Arkan with a 5.5km range which pretty much matches ATAKA would suffice fired from the 120mm gm. For engaging ground targets and helicopters rate of fire with 1000 r/min is enough, what is higher is more waste of ammo. I higher rate of fire is not a waste of ammo unless you are using uncontrolled bursts. Su-25 pilots found engaging targets in Georgia that the 30mm cannon was spitting out ammo too rapidly at 3,500rpm and they found they were wasting ammo... or running out too quickly. With fixed burst lengths there is no issue of ammo waste. Indeed the AD vehicles are looking at the skies for targets, the IFVs are delivering, transporting and supporting troops, the BMPTs need to support tanks by taking on enemy anti armour capacity or engaging enemy that represent a threat that the tanks have trouble dealing with. Interesting... because I am actually thinking the opposite... the focus will turn back to APCs because IFVs will become as well armoured as tanks so the gun that can defeat the enemy IFV used to be a light cannon (30mm), then got more powerful as IFV weight went from 20 tons to 30 or 40 tons, which made guns go to 40mm or 45mm or 57mm, and that the next step will be MBT based APCs which means the IFV will need a MBT level gun... or missiles with a lighter cannon... so do you keep the IFV or do you go to an APC that has a HMG or light cannon armament with a few missiles for self protection and then go for a missile vehicle to deal with all the enemy IFVs and APCs with tank level protection? If you change to an APC then you loose a lot of direct fire fire power... so a BMPT suddenly becomes interesting again, though 30mm guns would be a bit anemic... a larger calibre gun firing decent HE rounds preferably using standard ammo... 120mm rifled gm ticks those boxes to me. The problem is that if you want armament and troops and to keep both separate you will have a reduced troop capacity and a reduced ammo capacity and add risk of losing a lot of troops if the ammo area is penetrated... blow out panels are not perfect. Interesting, though perhaps too much duplication. The 23mm in a gatling would need a dual feed if you want to use it as an anti armour vehicle as the HE would have a different trajectory to any APFSDS round you could develop for it which means mixed belts would have totally different points of aim so you would need to select AP or HE with the aim point adjusting for the different ammo types. The main problem is that except with exotic materials the 30mm is becoming marginal in terms of anti armour performance, whereas a 45/57mm gun ticks both boxes of HE and AP performance but with much larger rounds of a much reduced ammo capacity potential. And I appreciate Medos perspective that this vehicle ideally is a Shilka/BMP-2 that can survive enemy ground fire like a tank. I think the BMP-3Ms armament would normally be ideal for a medium and light brigade, but that for an armata brigade, I think the situations it will be used in would benefit from the increased fire power of a 120mm weapon, and the increased ammo capacity of the 23mm gatling. Previously I have suggested replacing the 2 2A42 cannon with a single twin barrel GSh-30K cannon, but the 23mm gatlings rate of fire offers a lot of potential against ground and aerial targets in my opinion... with a decent fire control system and controlled burst fire... perhaps with dual feed and APFSDS rounds or perhaps not. This is absolutely true for point targets, but infantry is usually not a point target, but area to cover. So with too high rate of fire you could empty your load before you reach the end of area. This is a trick with two 2A42 guns, when you could fire only with one gun in low rate of fire and when first gun is empty you could use the second one. It gives you time to nail enemy infantry on the ground that other artillery could than clean that area. It is enough. Higher rate of fire is important for fast jets or small targets as bombs or missiles, but helicopters neither small neither fast. Helicopters are problematic, because they could hover very low and quickly change position to use its weapons and with that problematic for AD behind to not to shoot on their own troops in front of them. BMPT in that case is in front together with tanks and have no problems with fire. 23 mm gatling is excellent weapon to engage small flying targets as mortar rounds or high flying ATGMs like Javelin or Spike. In that case it need proper FCS, most probably with tracking radar to be effective. Those guns I more see to be used in medium and lighter brigades, which have weaker armor and are more vulnerable to this treat. They could form a C-RAM version on 8x8 armored vehicle with EO and radar FCS. Of course in that case this vehicle will not carry troops, but the turret could be a RWS type with its space filled with ammo and operator sitting behind in place for infantry. This is absolutely true for point targets, but infantry is usually not a point target, but area to cover. So with too high rate of fire you could empty your load before you reach the end of area. With variable gas system you could easily vary the rate of fire of the GSh-23-6 if you need to. As far as I know the gun in the Mig-31 is referred to firing at 9,000 rpm while the guns natural rate of fire is something like 12,000 rpm. With different gas settings different firing rates could be achieved and indeed even at very high rates of fire the speed of traverse of the gun can be altered to cover an area faster with a higher rate of fire... blazing away at an unseen enemy is dreadfully inefficient anyway. It gives you time to nail enemy infantry on the ground that other artillery could than clean that area. I think you are simplifying it too much... helos will hunt AD vehicles first when they can, but even when hunting armour they will use stand off distances whereever possible because armour includes APCs and APCs have soldiers with Igla gripstocks and lots of 30mm cannons. BMPT has no air search radar and will be no better off engaging helos than a BMP-2 or BMP-3. With modern fire control systems a modern tank probably has a better chance of a kill than a BMP or BMPT... the distinctive signature of main rotor blades showing from behind a tree... APFSDS rounds will penetrate the tree easily and demolish any aircraft hovering behind out to very long range... Missiles will kill even further out. 23 mm gatling is excellent weapon to engage small flying targets as mortar rounds or high flying ATGMs like Javelin or Spike. I disagree... the 23mm round is too small for a proximity fuse so only the rounds that hit will explode and do damage... the rest will be wasted. Against a ground target on the other hand... all will hit the ground on or near the target and all will contribute to a fragment storm that will damage the target and things around the target. A quick burst of 23mm directed at the puff of smoke where a Javelin or Spike originated from offers a reasonable chance of injuring a member of the crew, but a guided shell or APS are much better for dealing with the incoming missile. Infantry is not always running in the open. Often they are dig in. To nail them means to not allow them to fire ATGMs and not to allow them to escape enough long, that rockets from Tos clean the area. BMPT doesn't have infantry to care about. If IFV could fire on helicopters in self defense, BMPT could hunt them. About search radar, many AD systems doesn't have search radars like Strela-10, Avenger, LAV-AD, etc. They all got info through data link and C4I, same as BMPT. AD battery command posts could provide target info to BMPT too. Phalanx have only 20 mm gatling gun and is very effective in C-RAM use. BMPT doesn't have infantry to care about. Air defence vehicles will be scanning the skies (ie with sensors and eyeballs) for threats, the BMPT will be too busy looking for threats to the tanks. About search radar, many AD systems doesn't have search radars like Strela-10, Avenger, LAV-AD, etc. They all got info through data link and C4I, same as BMPT. AD battery command posts could provide target info to BMPT too. It would be far more efficient for AD vehicles to worry about enemy helos... even friendly fighters are far better equipped to take on helos than most non AD ground vehicles. With reduced weight projectiles the muzzle velocity is very high, which means flight time to target is relatively short which is useful for engaging aerial targets. Of course the lightened projectiles means less effect when the rounds hit the target... but no point in having super lethal rounds that never hit. Another point for you gentlemen to consider is that if the next-gen IFVs are equipped with 57mm autocannons, which now looks likely; then they may well be better equipped to deal with helos in the immediate area of operations than the BMPTs or MBTs might be. As I recall the 57mm in the role of an AA gun was already discussed on these forums. The Swedes use their Bofors Naval 57mm cannon in order to engage anti-ship missiles; I suspect that a helicopter would pose no problem. Their shells are heavier and will keep momentum for longer; so the effective range will be a good deal bigger than anything the 23mm or 30mm guns can muster, and the velocity of the projectile will also be greater; both on impact and also on the way there. This means that the helicopter will have less time to react and evasion will not be as effective; and of course no helicopter armour can stand up to a 57mm round, HE or AP, even at the maximum end of their effective range. The 57mm has a lower rate of fire but a helicopter is unlikely to be traveling fast, at least in a lateral direction relative to the cannon - so factors such as rate of fire and spread won't be important. In fact the 57mm gun's greater accuracy will be an advantage here; due to their momentum I'd imagine that the 57mm projectiles will follow a fairly straight ballistic path for a few kilometers even when shot up at an angle into the air; with a good FCS the IFV should be able to track and hit the helicopter directly with every shot fired. Inexpensive beam riding 57mm rounds will probably show up soon. I actually wonder if they may go for the 120mm BMPT to save money as the Armata chassis will be costly. If the BMPT can also serve as a indirect fire weapon in a pinch, they wouldn't need a purpose built Armata mortar carrier wasting available Armata's for the heavy brigades. Exactly. Helicopters are the most dangerous treat to tanks. Tanks could deal with enemy tanks and other armored vehicles and even with infantry with their heavy machine guns. Helos are the treat BMPT have to deal with. And deliver the most dangerous helos to BMPTs, because they could not fire on them, if they don't want to fire on their own troops. True, the problem are helicopters, which fly extremely low and AD vehicles could not fire on them, because they are far behind. It's true, that fighters are the best weapon against helos, but Russian doctrine is based on option, that they have to fight with stronger enemy, what means enemy could have air dominance. 57mm is a calibre where you can start to do interesting things... like AINET like fuses... though I have heard the Russians have developed such a fuse for 30mm ammo. with a good FCS the IFV should be able to track and hit the helicopter directly with every shot fired. The issue I think will be equipment or as they are called in aircraft avionics. The BMPT and a mortar carrier have similar armament but very different roles and different ways of using their main armament. A mortar carrier is tube artillery that hangs back from the front line to engage enemy hard points with plunging indirect fire, but with a MBT level of protection there is no reason for it to sit back... it could operate with the troops which maximises its range. However if it is moving with the troops then direct fire will also become a likely occurrence too so it will likely be using direct and indirect fire while the BMPT will use mostly direct fire. They will likely both engage enemy hard points or areas of suspected enemy activity so I guess by linking it to the artillery net the BMPT should be able to do both jobs, but it will do the mortar carrier role from a different position in the formation and in a different way. Use of guided shells should make it much more efficient so fewer rounds will be needed to perform the same mission. I really don't see it as a way of saving money by reducing the number of types within the unit as the BMPT would be a new vehicle so more vehicles would be required and I suspect to support the tanks... which is their role that in some circumstances a two to one ratio with tanks would be needed so one BMPT for two MBTs, while in others a higher ratio of two BMPTs per MBT might be desirable (where there is no infantry support at all). In such a case having BMPTs in the tank platoons as BMPTs and also in the mortar platoons as mortars would mean you have a reserve to change the balance of vehicle numbers depending on what is needed. But that is the issue... I think tanks with MG fired laser beam riding missiles and even APFSDS with scramjet boosters and some guidance would be several levels better at engaging enemy helos than the BMPT except when the BMPT has a 120mm gun. As FP points out however IFVs with 57mm laser guided shells would actually be much more efficient and effective than both, and actually Pantsir-S1 and TOR and BUK would also be rather more effective. The enemy wont have that many Helos and with the wide distribution of MANPADS which is common in Russian units they wont last very long anyway. I think you are over estimating the potential of enemy helos... at 2km range a tank can hit a very small target and the very short flight time of the round means that even moving targets can be engaged accurately. With laser beam riding missiles its effective range is dramatically increased... with modern optics modern tanks are less vulnerable to helos than they are to enemy ground troops in anything but the flattest and most open terrain. I would say Russian doctrine is very conservative about their air force protection, that's why they have such big ground forces air defense as well as ATGM capable to engage flying targets as helikopters like Kornet, Krizanthema, Ataka and Vikhr. Western ATGM are not designed in that way to engage flying targets, but only ground targets with top attack capabilities and flying slower. I agree... the reasoning behind Tochka-U and Iskander-M is an all weather ability to deliver a 500kg payload to a point target in minutes... in the west that would be an F-16 with a laser guided bomb, but for Russia it is an Army strike weapon that can hit point targets 24/7 without worrying about enemy air defences or aircraft availability. Equally they don't expect to fight with their own air force above them so they are very well equipped to engage enemy air power too.